This source is particularly interesting, because it demonstrates the complications of archival research. This image, originally believed to be a portrait of Matilda Beasley, manager of the Sacred Heart Orphanage. Beasley was born enslaved, became free, and moved to Savannah, where she became a teacher to enslaved children, got married to a free black man, and led a devoutly Catholic life. 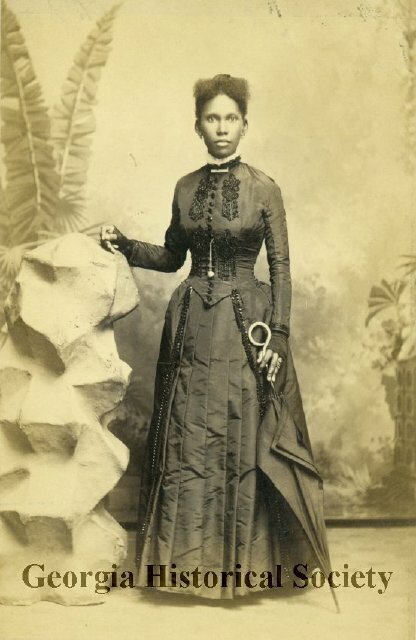 Beasley is extremely famous in Savannah history, yet the woman in the picture is most likely of Josephine Beasley, wife of Abram Beasley who was a child of Mathilda’s husband. 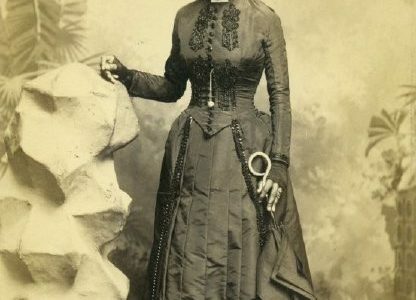 Based on the style of clothing and hair the image is thought to be circa 1890, when Matilda would have been 71 years old. 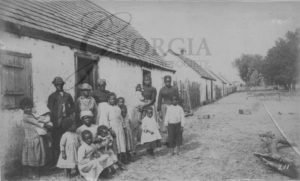 Between 1883 and 1892, photographer William E. Wilson documented the lives of sharecroppers and day-to-day life in Georgia through his photography. Wilson made his living doing portraits but he had a passion for documentary photography. This type of photography focuses on capturing the everyday. Unlike a posed portrait, these photographs show a more unstaged view of life in the Savannah area during the late 1880s and early 1890s. Former slaves in front of former slave cabins on St. Catherines Island, Georgia. Photograph taken between 1883 and 1892 by William E. Wilson. Courtesy of the Georgia Historical Society. 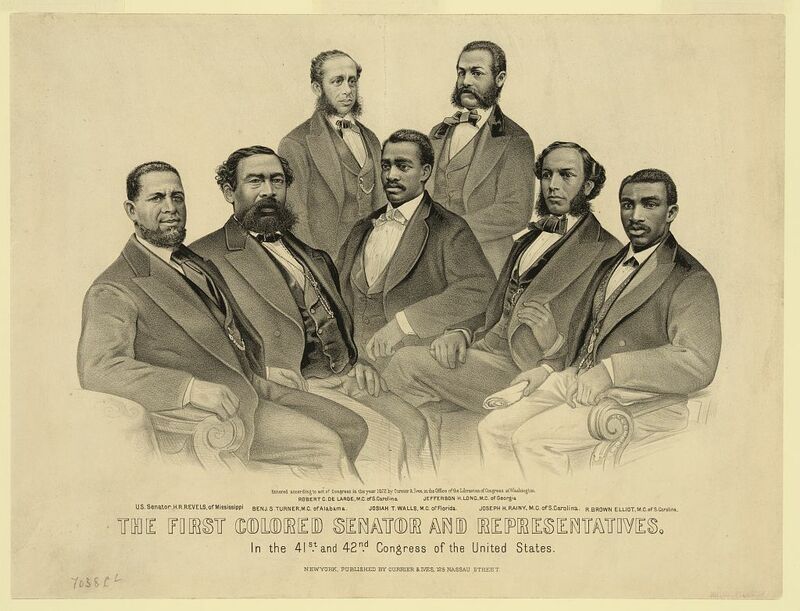 This group portrait shows the first African-American congressmen to serve in the United States Congress. During Reconstruction, Republicans gained the upper hand in Georgia politics, and African Americans served in Congress at both the state and national level. 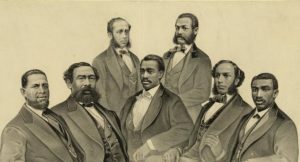 Thirty-two African Americans were elected to the Georgia Assembly in 1868. Standing in the back on the right side is Jefferson Long, Georgia’s first African-American senator. At Reconstruction’s end, Democrats gained control of political power and an African American would not represent Georgia in Congress again until Andrew Young in 1972. 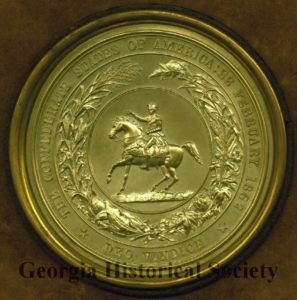 This Confederate seal–with the inscription “The Confederate States of America : 22 February 1862, Deo Vindice”–was reproduced as a fundraiser for the widows and orphans of the Confederacy in 1873. The seal commemorates the election of Jefferson Davis, the only president of the Confederate States of America. William Jones was a planter in Columbia County, Georgia. Following the Civil War, Jones was pardoned by President Andrew Johnson on August 25, 1865. 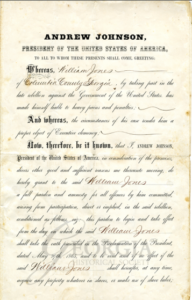 On December 5, 1865, Jones took an amnesty oath pledging to support and abide by the Constitution of the United States. This pledge was required for anyone who wished to vote or participate in the Reconstruction government. 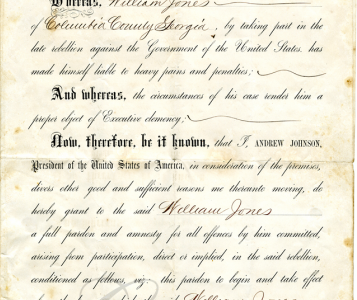 William Jones Pardon 1865 by Andrew Johnson. From the Georgia Historical Society Manuscript Collection. MS 449. This decade or so following the Civil War was an unprecedented time in political history, bringing black southerners, many of whom were enslaved only years earlier, to local, state, and national offices. 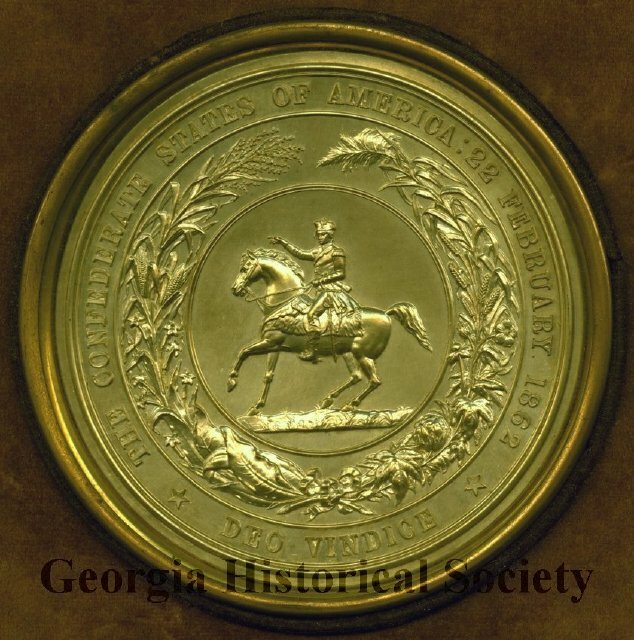 Moreover, the technological innovations of the 19th century allow students to see photographs commemorating progress, such as black politicians, as well as mementos, such as the Confederate Seal below, glorifying the Old South of antebellum and the Confederacy. The primary sources below will bring Reconstruction alive and demonstrate the importance of the years immediately following the Civil War. Click here for a teacher guide to this primary source set. Copyright © 2019 Opening America's Archives. Powered by WordPress. Theme: Accelerate by ThemeGrill.